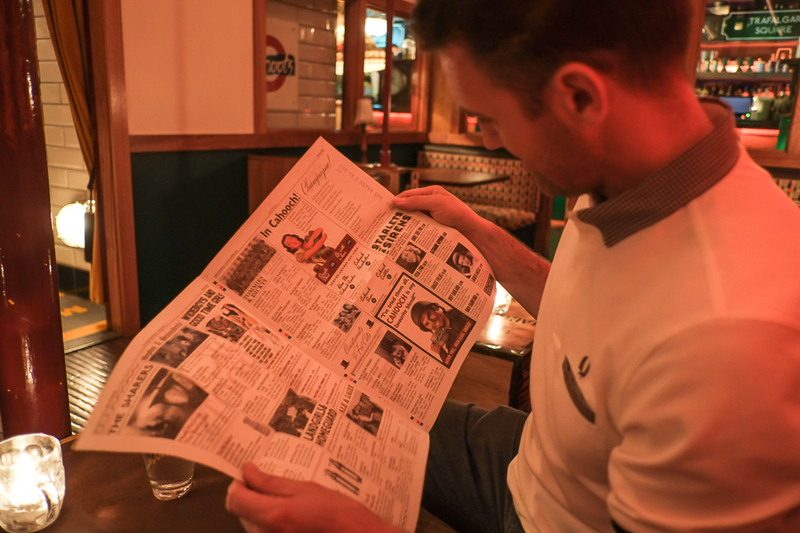 These days we don’t often get the opportunity to nip out to a bar on a Saturday night, and I confess that I feel a bit out of touch with whats ‘hip and happening’ in London. I may have once lived on the lock in the heart of Camden in NW1 with bars and clubs literally on my doorstep, but these days, living in Maidenhead it’s a pretty different state of affairs. So as my husband and I planned a night off (that turned into two, thanks Grandparents!) 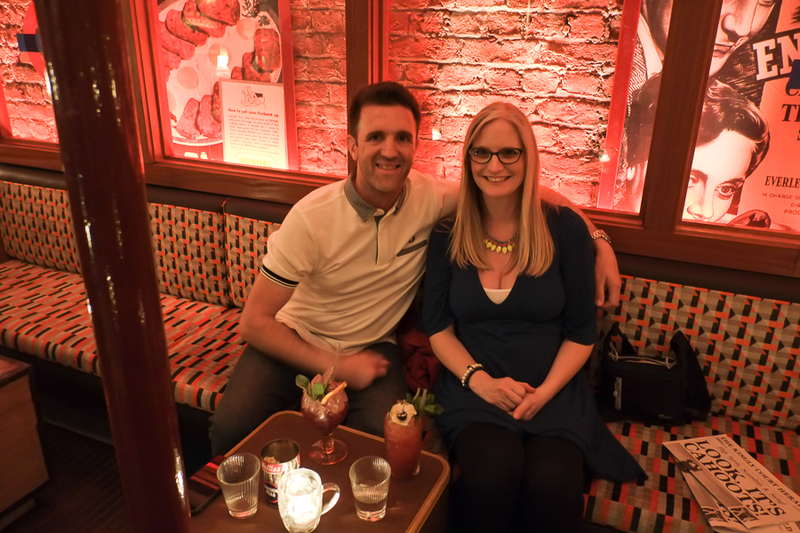 to celebrate our first Wedding Anniversary I started to do some research about where we could go for a drink, something a bit different… but somewhere that a couple in their 30s and 40s wouldn’t feel out of place. Oh, and add in the fact that I would be 5 months pregnant, so not really drinking, and unlikely to want to throw any shapes on the dance floor. Or even be awake past 10.30pm. Ha! That’s quite a tall order… and meant that Shoreditch wasn’t really on the agenda. We were hoping to find a cocktail bar, somewhere to sit and somewhere to feel we were experiencing something very ‘London’. Its not often that we get to escape Berkshire! Something very different, but brilliantly cool, and super relevant to our transport theme that we chose for our London wedding. 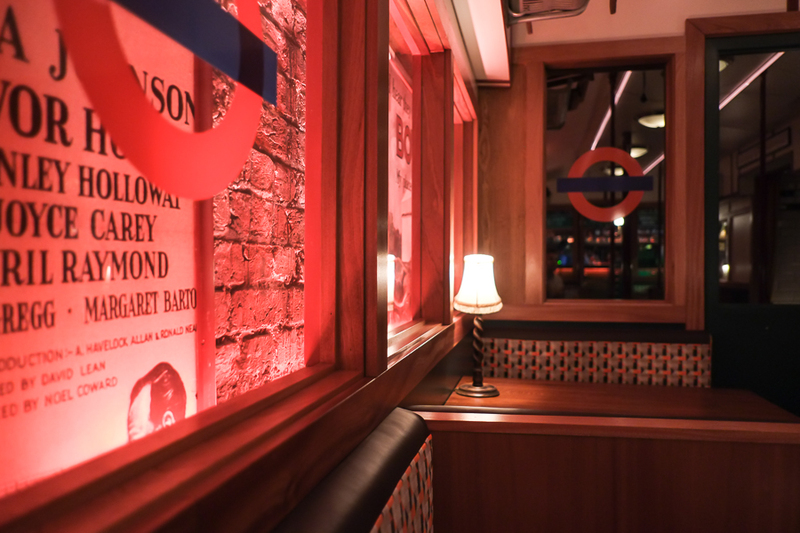 ‘Cahoots’ is a bar that’s been built in an old air raid shelter near Carnaby Street thats themed in a 1940s Underground station vibe. 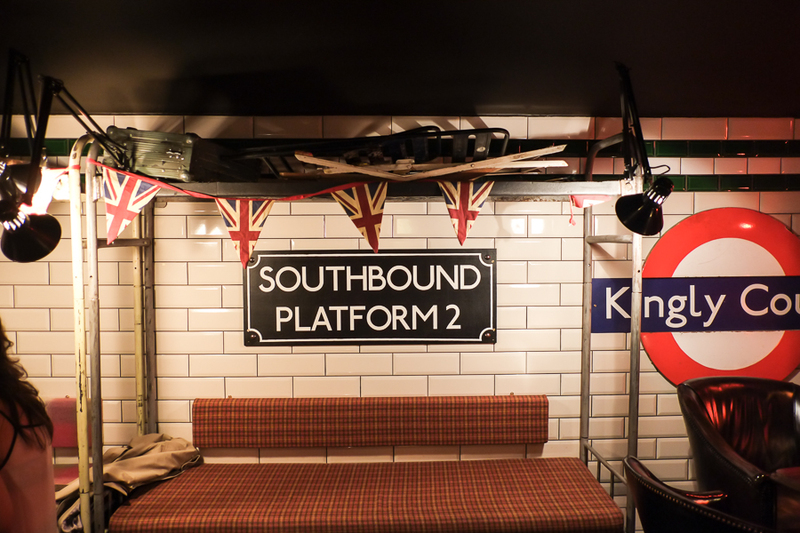 There’s retro London Underground signage, sandbags, original tiles and posters, and even the ‘moquette’ patterns from London Transport on the seats. It openend in March this year and has become extremely popular. The first step was to book a table. Although I’d been super organised in booking our babysitters months in advance, I confess to leaving it until a week or so to actually finalise where we were going. First mistake! 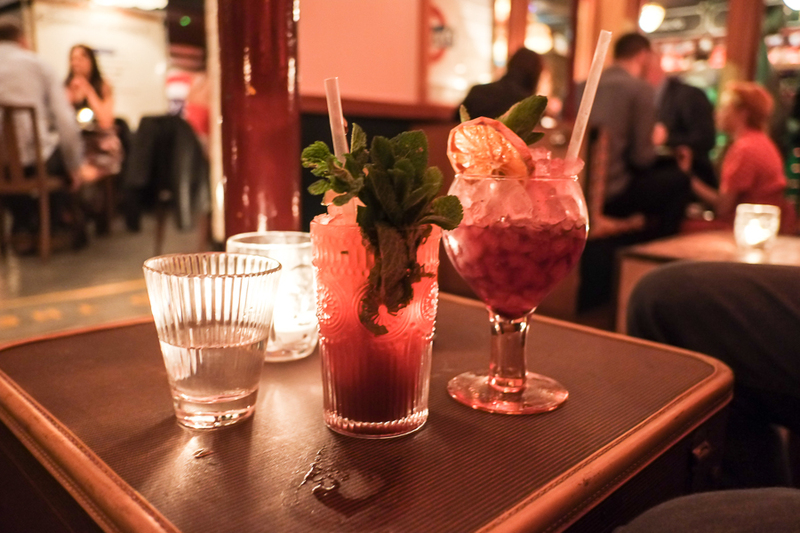 Cahoots is very popular, especially on a Saturday night and you need to book a place in advance. Fortunately, their PR team were willing to let me reserve a table from 5-7 in return for sharing my experiences here on the blog. Keep your eyes peeled if you want to find the bar. 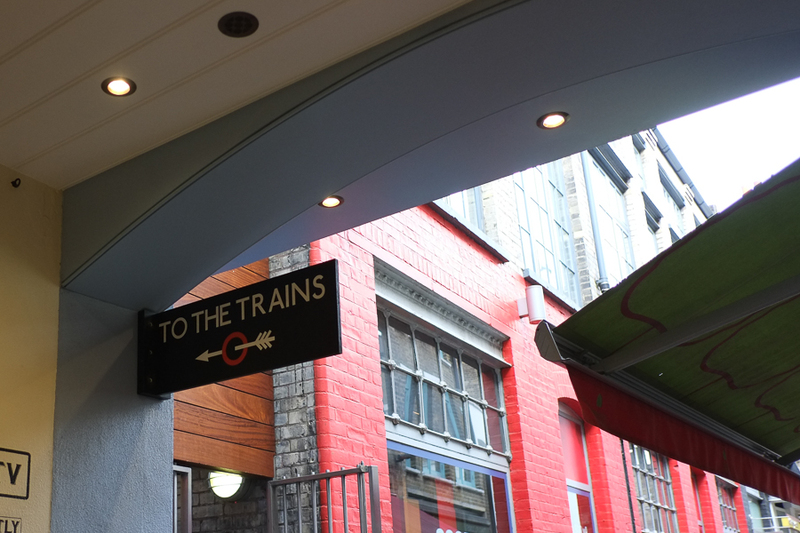 Tucked away under the sign for the trains was a doorway manned by a friendly host with a clipboard checking off our names and they ushered us inside to another gentleman who asked (in his finest Cockney) if we were ‘here to see the Captain?’. It really did feel like we needed a code word to access the bar, but it helped us feel we were entering an exclusive world! The bar was already b buzzing, even though it only opened at 5. 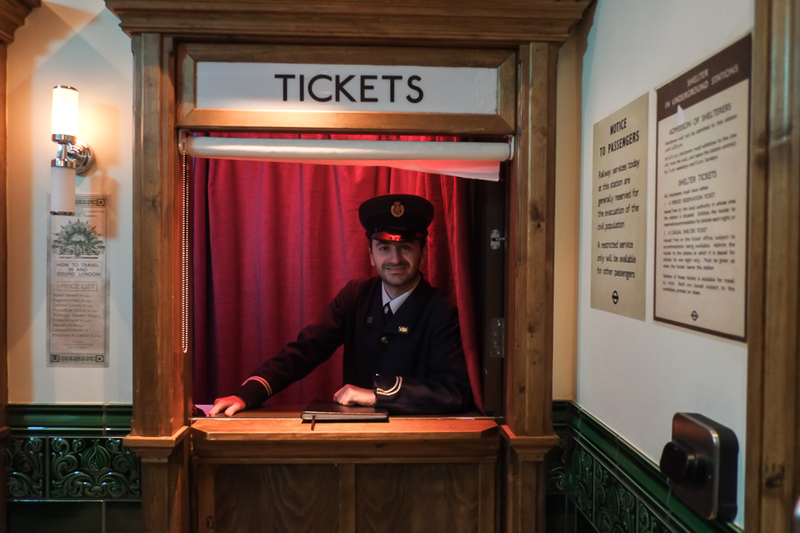 As we headed down the stairs (styled like an original wooden London underground escalator) we encountered the cloakroom, which continues the theme as the attendant sits in a ticket office! 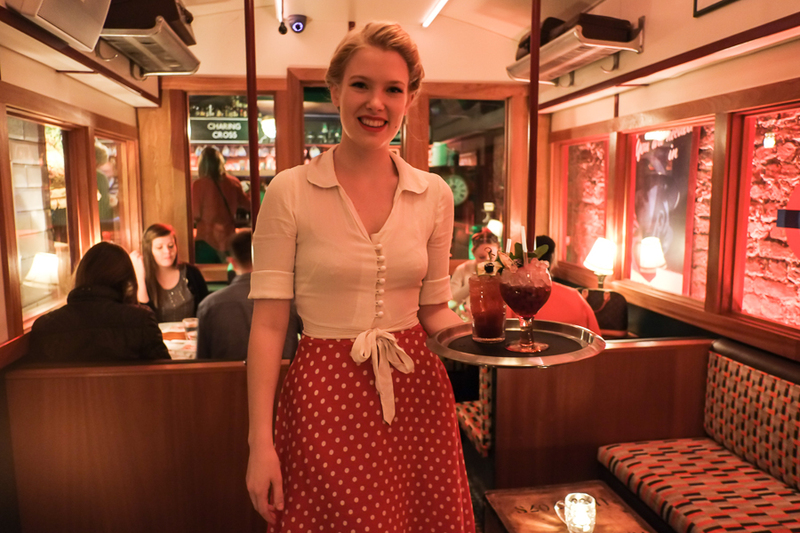 Although to had only been open 15 minutes, the bar was already busy, but we were shown to our reserved table in the train carriage area and introduced to our waitress, who was dressed in a 1940s style vintage red and white dress. She showed us the cocktail menu (which is in the style of a newspaper) and left us to make our choices. 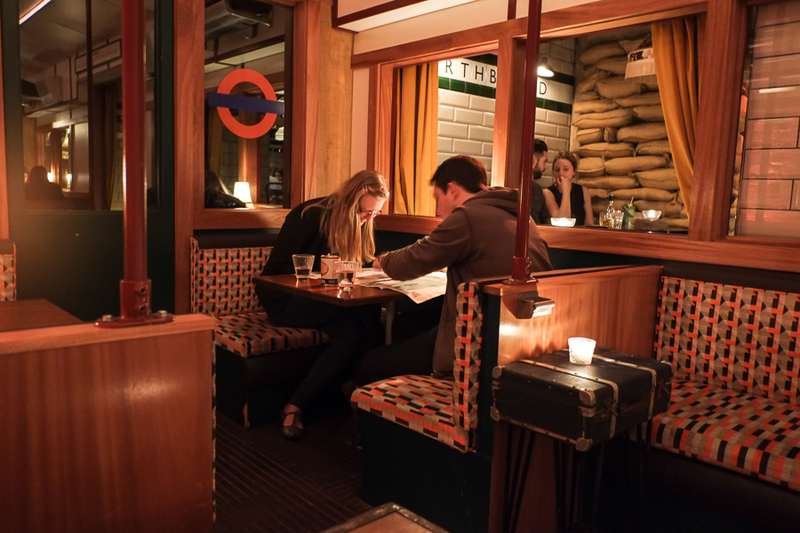 The tube seats are made from ‘moquette’ the fabric used on the London buses, trains and tubes… also featured on our wedding invites! So much choice! 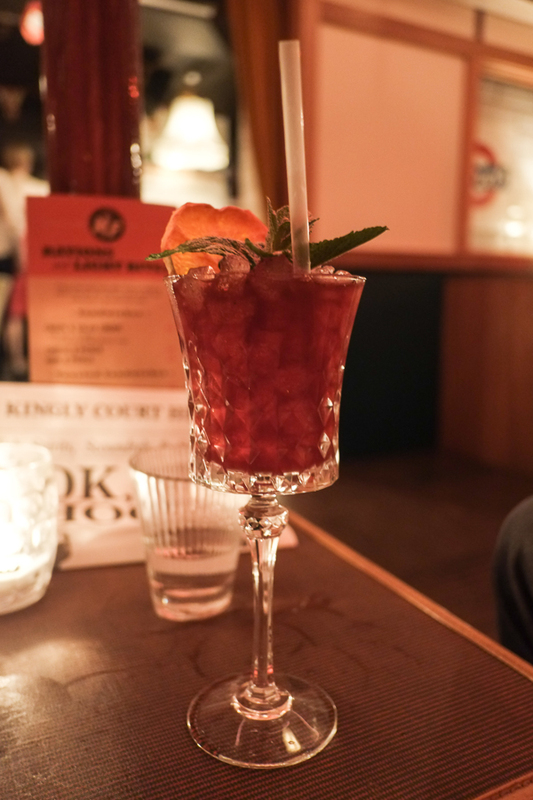 Definitely going back again when I can have a ‘proper’ drink! Happy First Wedding anniversary to us. The cocktails arrived along with some popcorn in a old styled tin can and we enjoyed people-watching and absorbing the environment. Even the water looked stylish and came with complimentary popcorn. 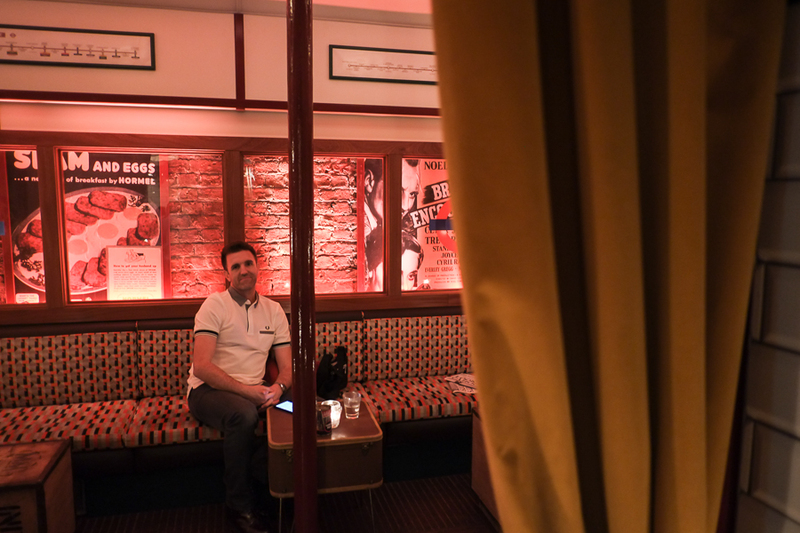 The lovely thing about the bar is that everyone has had to book to get a table, so everyone really wants to be there, it’s not the type of place that you accidentally come into. You could see everyone else was pleased to be there and there was a lot of photography and instagramming (new verb?!) going on. Plus, we weren’t the oldest people in the bar! RESULT! In the war people would add homely touches to air raid shelters and they have done the same here. If you’re feeling peckish there’s a snack menu available, although aside from the novelty value of crisps and salad cream and spam sandwiches, we didn’t really fancy giving it a go. Besides, we only had our table until 7pm and the plan was to head back up to St. Pancras where we were staying for our evening meal. 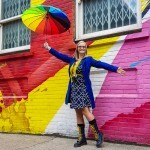 I’m always keen to remain open and honest on my blog and so I think its only fair to mention that there was one, slight negative point in our visit. 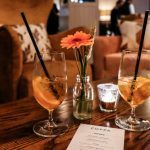 At 6.30pm our conversation was interrupted by the bar manager when she came over to tell us that the people who had booked the table after us had arrived, and could we please leave the table and finish our drinks at the bar. 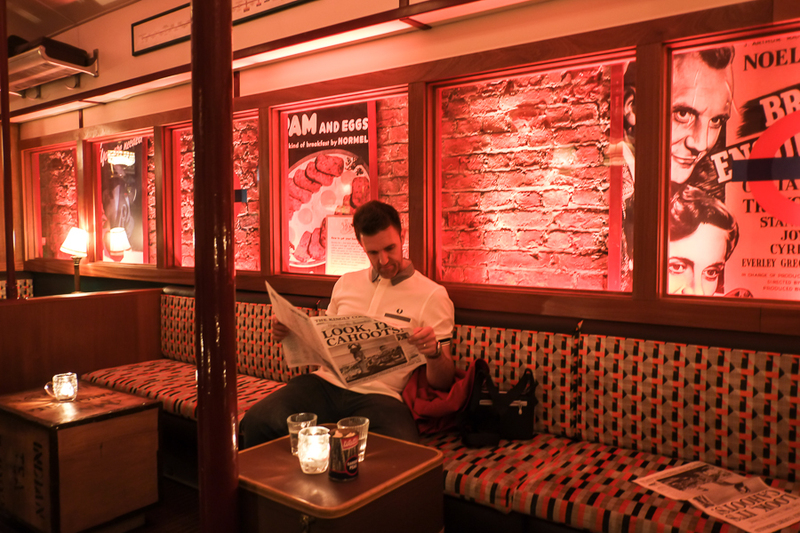 We were a little surprised as it seemed a bit abrupt after the rest of our time had been so smooth and stylish, and to be honest, one look at the bar by this point showed it was little crazy up there… not my preferred choice, especially being pregnant, I was enjoying the sit down! Seeing as we’d booked that table via the PR contact I didn’t want to make a fuss as I wondered if there had been a mistake, and that our table had only been booked until 6.30pm instead of 7pm? So we finished our drinks and made an exit, a little disappointed that our experience had been marred by the abrupt ending. I’ve since spoken to the PR contact and they confirmed that our table had actually been booked until 7pm, so this feedback has been passed back to the bar so hopefully, if you’re able to go, you won’t have the same thing happen to you. 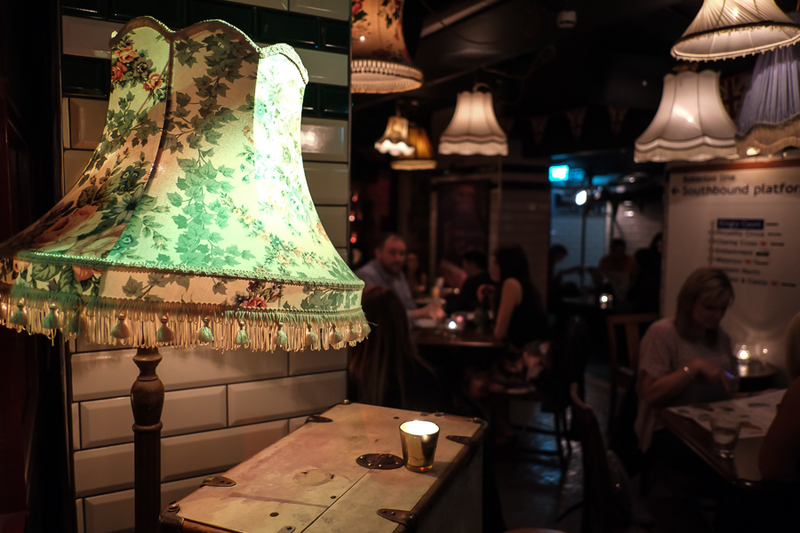 But, absolutely hand on heart, I would still recommend Cahoots to anyone looking for somewhere a little different, especially if they want to impress the other half with their superior London knowledge! 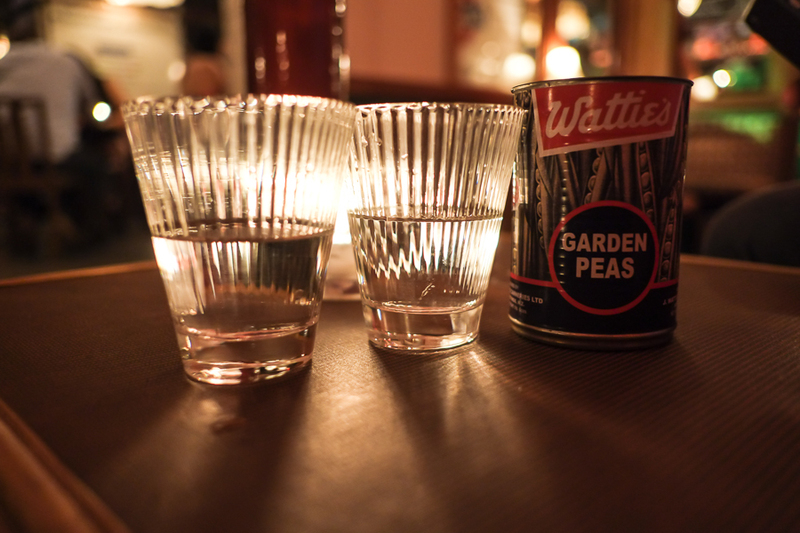 Not only do Cahoots serve a wide range of cocktails, but the environment is in a league of its own. You can’t help but smile as you notice the care and attention thats gone into all of the detail to bring the era to life. 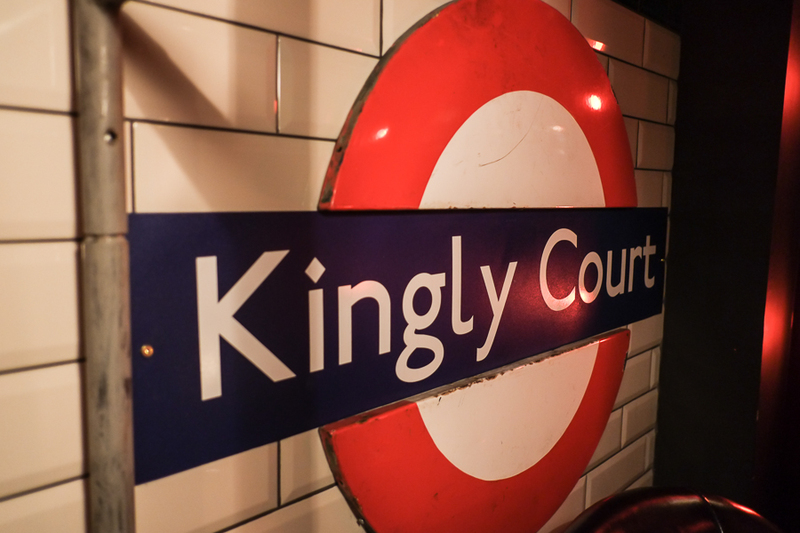 It’s completely unique, and feels like a real bit of London history, combined with a fantastic cocktail menu that doesn’t break the bank! Total win from my point of view. When will she ever stop taking photos??! 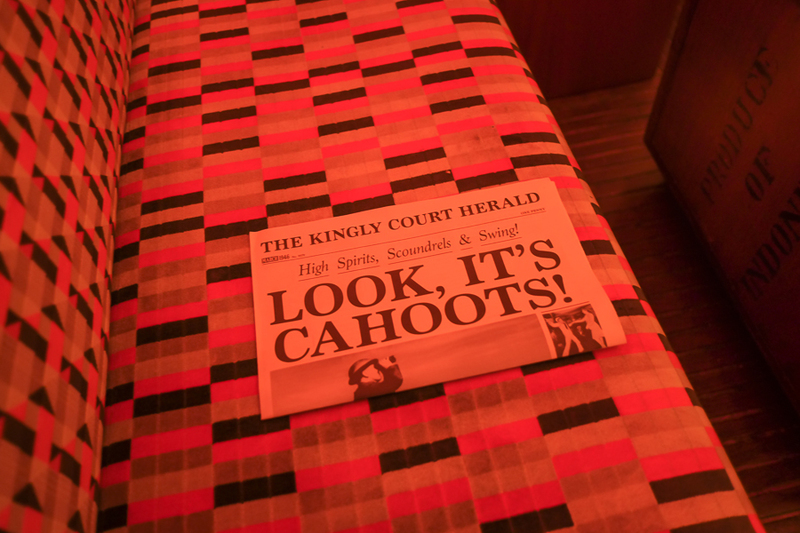 If you’d like to visit Cahoots you can reserve a table online via their website. They’re open from 5pm to 1am Wednesday to Friday, 5pm to 2am Thursday and Friday and on Saturday from 5pm to 3am. 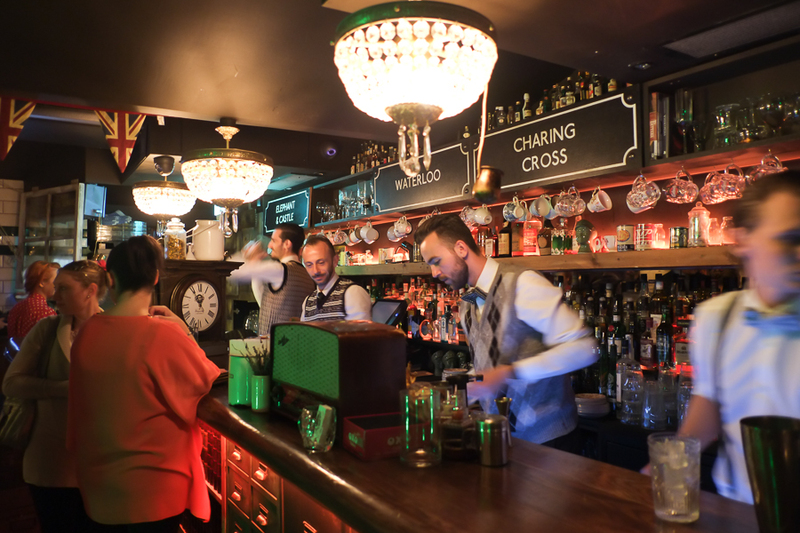 The bar is located just off Carnaby Street and is a short walk from Oxford Circus or Piccadilly tube. 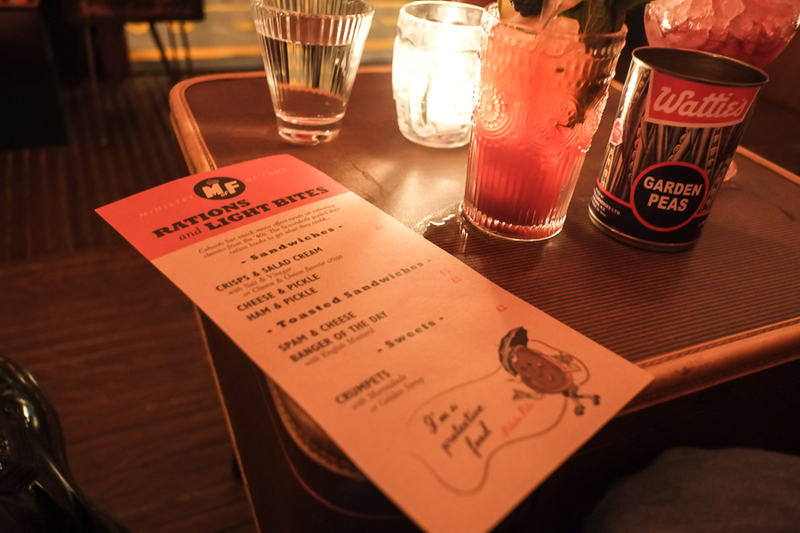 In return for sharing my experiences on the blog, Cahoots reserved a table for me on a busy Saturday night. As always on the blog, I’ve been as honest as possible about my experiences. 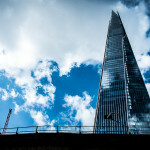 All photos here were taken by me and I retain the copyright.